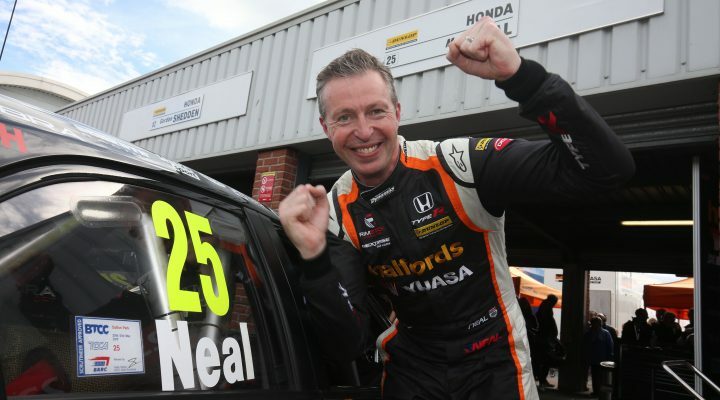 Matt Neal will start tomorrow’s opening Dunlop MSA British Touring Car Championship race from pole position after the Halfords Yuasa Racing star set a blistering pace during qualifying at Oulton Park. The triple champion took his first pole position in five years with a stellar effort at Thruxton last time out, and the experienced racer backed up his fine form with yet another in successive events. BMW Pirtek Racing’s Andrew Jordan led the way early on as the 2013 champion looked to be a serious contender. Jordan had endured two relatively lacklustre weekends at Donington Park and Thruxton respectively, but he bounced back today with the potent ballast-free BMW 125i M Sport beneath him. The Bavarian machine has often gone well around the picturesque Cheshire venue and its credentials were also underlined by Rob Collard and Colin Turkington later on in proceedings. Two Hondas endured offs as reigning champion Gordon Shedden recovered from a slide at Cascades, although Matt Simpson wasn’t so fortunate in a separate incident. The Simpson Racing Civic Type R ran wide at the exit of Druids and then speared into the barrier on the inside of the track as Simpson tried to correct his mistake. The red flags were thrown to recover the stricken Honda, but not before Aiden Moffat, Ashley Sutton and Mat Jackson had joined Neal and Jordan at the top of the timesheets. A five minute shootout would determine the final grid positions although improvements were hard to come by for much of the field. With Turkington languishing down the order, however, the Ulsterman produced heroics to haul his ballast-laden BMW up to fourth place ahead of Shedden’s Honda, who had himself responded well to his earlier moment. So as the chequered flag waved, it was Neal from Jordan and Moffat’s Laser Tools Racing Mercedes – the young talent again showing his class following a maiden BTCC breakthrough victory earlier in the season. Turkington and Shedden were next on the timesheets, ahead of Ash Sutton’s Subaru Levorg, who once more proved the pick of the Adrian Flux Subaru Racing squad. The two Fords of Mat Jackson and Josh Cook were seventh and eighth respectively, whilst Collard and rookie Senna Proctor initially completed the top ten. Proctor, however, along with another five drivers (see penalties below), lost his fastest time for a yellow flag infringement. This handed a top ten berth to Jake Hill in the TAG Racing VW while Proctor was classified in 16th. Two high profile drivers endured tougher sessions than their younger team-mates as Jason Plato spun his Subaru Levorg before having to settle for 17th on the grid, whilst Power Maxed Racing’s Tom Chilton couldn’t match Proctor’s pace – he eventually finished 30th in his Vauxhall Astra. The relentless pace of the session was proven as the top 25 drivers were covered by just over a second with the entire 32-car field blanketed by 1.797s. That final position unfortunately went to Team Shredded Wheat Racing with Duo driver Martin Depper, who also crashed into the barriers in the closing minutes.